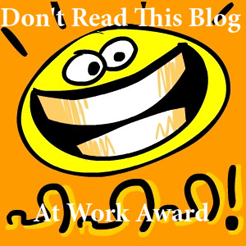 You may nominate no more than three bloggers, each of whom must have made you laugh out loud with at least one post. Those who receive the nominations may consider themselves as having received the award, and they must post a gushing acceptance speech thanking the person who nominated them, and perhaps thanking any companion animals they may blog about. And maybe closing with a shout out to their lord and savior or, failing that, their parents. Those who receive the award may, but need not, pass on the award, but will not themselves be eligible again until they have published at least ten more posts. somesummersunday – I have laughed way too hard and more than once on these incredibly sarcastic/hilarious posts. katie christon – Recently found…should not have been reading in the library while others were still studying…almost didn’t make it out alive. Embracing Insanity – Another recently found gem, didn’t get far down the first post without laughing. So my for my acceptance speech, first off I would like to serenade iliketheworldfuzzy with my endearing gratitude. A thousand thanks to a person with a heart of gold. Her story is one of the more inspirational that I have had the luck and pleasure of coming across. Compared to many of the veteran bloggers, I guess you can say, I am relatively a nooooob. I felt like a baby duckling that was thrown into a moat full of crocs, only expecting to be torn apart by my incessant ramblings and complaints of being just another ordinary college kid. However, strangely, I was welcomed into this relatively new world by many a visitors. Welcomed and lifted up…to continue being honest. It has motivated me to continue to be honest, not only with others…but with myself. I don’t know, but for me…having a blog is very cathartic. Having a very stressful day and coming home to write about it has really helped relieve some of the unnecessary tension that builds up throughout the day. Congratulations!! I know how you feel, the duckling in the crocodile moat was something I went through as well.